Long considered an excellent Christmas tree because of its beauty, soft needles, stiff branches and long keepability, the species is growing in popularity. The Noble Fir (Abies procera) is a western North American fir, native to the Cascade Range and Coast Range mountains of extreme northwest California and western Oregon and Washington in the United States. The branches of the Noble fir are evenly spaced and have needles that are roughly 4-sided (similar to spruce), over 1 inch long, bluish-green and are generally twisted upward so that the lower surface of branches are exposed. Extensive efforts are made to produce a beautiful Christmas tree for the holiday season. Typically Noble firs are sheared or trimmed once a year but when there is a second growth another trim may be needed prior to being cut for the season. Much care is needed to make sure that there is a single straight top. 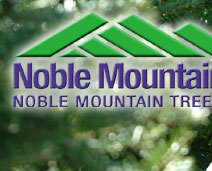 Nobles are fast becoming the most desired tree for the holidays and they come in two standard grades developed by the USDA. A USDA #1 Noble, can have one flaw such as an open space or a slightly crooked top. A USDA #2 Noble can have two flaws, however over the years science and experience has helped us to continually increase quality and grow more beautiful trees. 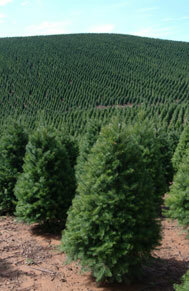 The USDA grade is also used for all other Christmas trees in the industry. The Douglas-fir (Pseudotsuga menziesii) has been the major Christmas tree species used in the Pacific Northwest since the 1920's. It is a wide ranging species that strangely enough is actually not related to the true firs. It grows throughout central California, western Oregon and Washington, parts of the Rockies and extends north to Alaska. It grows under a wide variety of environments from extremely dry, low elevation sites to moist sites. The branches are spreading to drooping and the buds are sharply pointed. The bark is very thick, fluted, ridged, rough and dark brown. Douglas firs are more dense than their counterpart firs. Their needles are dark green or blue green, 1 to 1 1/2 inches long, soft to the touch and radiate out in all directions from the branch. The needles have a sweet fragrance when crushed. Known as plantation trees, they are normally sheared once per year and will typically produce a marketable crop within 6 to over 8 years depending upon the site and growing area as well as the size desired. Referred to by the industry as Doug fir, they tend to grow a little faster than Noble fir and also tend to be easier to care for because of its ability to withstand more harsh growing conditions. 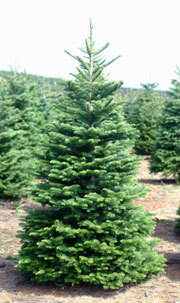 Nationally, it remains one of the most popular Christmas trees species. It is shipped to the majority of the states and Hawaii and is also exported to Mexico, Guam and some Asian markets. Known for its dark green color and exceptionally aromatic smell, the Grand fir (Abies grandis) is one of the tallest firs, reaching heights of 300 feet. Its popularity has also been increasing due to its needle retention, color and dramatic scent. It is native to the Pacific Northwest and grows in Oregon, Washington, Idaho, Montana and up into British Columbia. 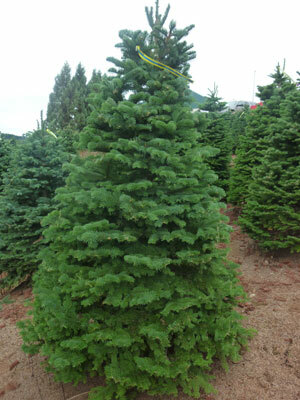 It is easily distinguished from other Pacific Northwest firs by its sprays of lustrous needles in two distinct rows. The needles are 1 to 1 1/2 inches long with glossy dark green tops and two highly visible white lines of stomata on the undersides giving it a somewhat shiny appearance. They are sheared and cared for and in most areas will become a marketable tree in eight to ten years. 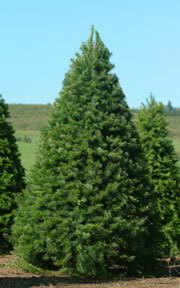 The Nordmann fir (Abies nordmanniana) is an exotic tree that is gaining popularity in the United States. It is native to the mountains south and east of the Black Sea, in Turkey, Georgia and Russia. They are grown in Denmark and other countries for the European Christmas tree market. 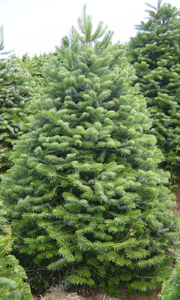 The Nordmann fir have lush, full, rich dark green, glossy foliage with needles a little over an inch long, and grow from symmetrically arranged branches. The branches are very strong, perfect for displaying special or heavy ornaments. 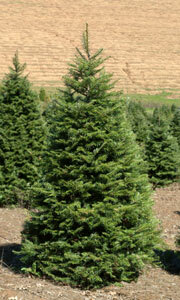 The needles are longer and softer than those of other Christmas tree varieties. 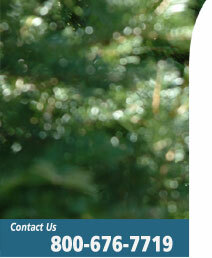 The Nordmann is a very durable tree with excellent needle retention. 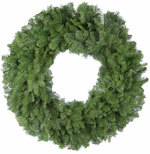 Handcrafted premium quality Christmas wreaths available. Constructed on sturdy wire frames using the freshest boughs for maximum keepability. 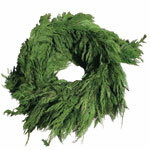 Fresh cedar garland available. Ask for details. 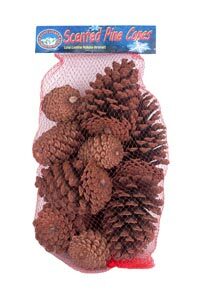 Premium Scented Pine Cones make a great addition to any holiday decor. The unique, carefully blended proprietary fragrance is pleasant to both consumers and employees alike. 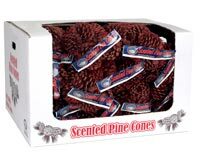 This holiday scented product assists retailers in increasing sales as cinnamon scented pine cones can be merchandised near the registers. Cones can come in a self-merchandising cut-away case. Easy stack cases create a great promotional floor dlisplay.